Reverend Ronald Nathan, Presiding Elder for the churches in St. Vincent, told Searchlight that the conference was a collaboration of business activities as well as worship and training sessions. The activities included training sessions on the responsibilities of pastors and the responsibilities of the different leadership roles within the church. Participants were also educated on the history of the AME Church. The Bishop of the Mid Atlantic II Episcopal District Churches Warren John and other international delegates were also present at the conference. John delivered the keynote address. International delegates at the conference expressed their delight at joining with fellow members of the church. Reverend Dr. Kevin McGill, of Hood Temple, Richmond, Virginia, said that he was delighted to meet with the members of the church of SVG, and it is his prayer that as the Zionâs church expand that âGod will grow what we have plantedâ. Rev. Dr. William Kelly, Minister of the Trinity A.M.E. Zion Church in Washington, D.C, added that it was a blessing to be part of the conference. âI am most delighted to share in the SVG Annual Conference of the AME Zion Church (The Freedom Church). As I have attempted to share my skills and experience, the people of SVG annual Conference have been a blessing to me. Under the leadership of Bishop Warren Brown, Missionary Supervisor Aurelia Brown and the presiding Elder Rev. Ronald Nathan and the pastors and people of this country, the best is yet to comeâ, he said. Nathan said that the church wishes to expand the outreach within St. Vincent and the Grenadines. He indicated that the local churches hope to do several educational programmes in the communities on HIV/AIDS as well as reach out to teenage mothers, and doing educational programmes for preschoolers. Nathan stated that plans are also in place to set up a local executive office of the church and to offer other programmes as well as conferences throughout St. Vincent. A youth camp or conference, Nathan stated, was also in the works. 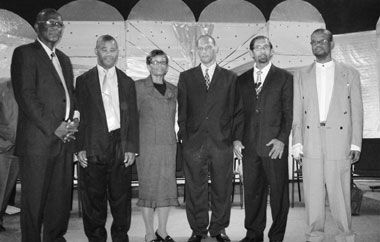 The conference also saw the appointment of Monty Roberts as the AME Zion Church Community Liaison Officer and the appointment of the District Officers for the Womenâs Home and Overseas Missionary Society and the Christian Education Department. The A.M.E. Zion Church was officially born October 1796; the new Black denomination was chartered in 1801 and firmly established in 1820 when the leaders voted themselves out of the White Methodist Episcopal Church. The next year, church founders agreed to call the church the African Methodist Episcopal Church in America and the word âZionâ in 1848.